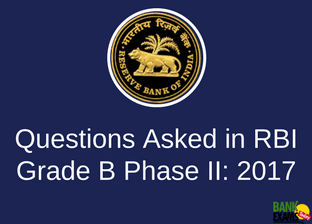 RBI Grade B Phase II exam was held on 7 July 2017. The paper was not too difficult as per the information we could collect from the candidates who appeared for the exam. Here are the questions asked in the paper. A passage was given which stated a particular percentage for India's growth (by a Paris-based organisation) and candidates were asked to calculate India's growth by 2018. The topic was related to Company Forecasting. A balance sheet was given in which they asked if it is financially acceptable or not.